Way back, when Pennsylvania was covered by a shallow sea (430 million years ago plus-or-minus), there was a lot of life in that water: trilobites and coral, brachiopods that looked like clams but aren’t related, and crinoids that look like flowers but aren’t. There were also eurypterids – extinct relatives of scorpions, some reaching more than six feet in length. And there were bony fish that looked like armored tanks. 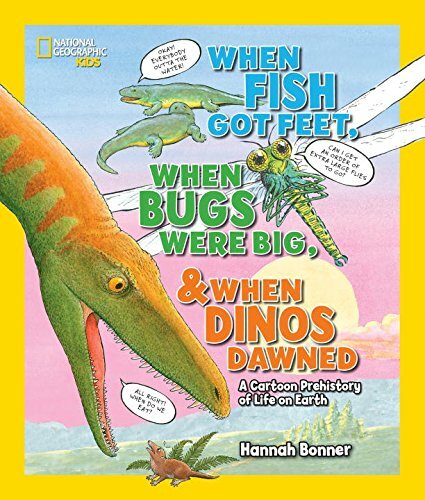 Bonner shows what it took for fish to become land animals, how bugs got their wings, and the beginning of dinosaurs. Back matter includes a timeline of life on earth, a vertebrate “family tree” and lots of activities for curious kids including a few on climate change and extinction. And, for parents – a dictionary of “how to pronounce the Scientific terms in the book” – because kids seem to have no problem with words like Eudimorphodon and Herrerasurus rolling off their tongues. 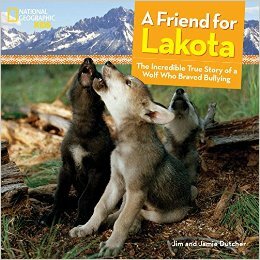 Lakota spends his days roaming the forest and meadows with his brother, Kamots. But where Kamots is fearless, Lakota is timid. A year later new wolves join the brothers, and they form a pack. As with all wolf packs, every member has a place. Some are leaders, some trouble-makers. Lakota’s job is to help everyone play. But his low position in the pack makes him a target for aggression (bullying). Fortunately, Lakota has a friend who won’t let the others tease and bully. And that makes all the difference in how Lakota develops into the compassionate adult he is today. Back matter includes a map and facts about gray wolves. The authors also write about their life living with the wolves, and include lots of resources for curious kids who want to learn more about wolves. When a huge wildfire engulfed the Funny River in the Kenai National Wildlife Refuge in Alaska, firefighters expected smoke and soot. The last thing they expected was to rescue a family of wolf pups. But sure enough, there they were – five fuzzy blue-eyed pups… and no tracks near the den. These pups were on their own. The pups were covered in dirt, prickly with porcupine quills, and in desperate need of food and water. So medics used syringes to give each pup a drink, then flew them to the Alaska Zoo. This story follows the keepers who fed and cleaned the pups, played games with them, and helped each one find his or her place in the pack. Back matter highlights the importance of wolves as a keystone species (animals that help hold an ecosystem in balance). 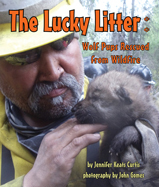 There’s also information on wildfires and some activities related to the book. He even helped grow the nation, writing the Declaration of Independence. But there was one thing that bothered Jefferson: a French naturalist wrote that wildlife in the new country was small and weak. So Jefferson set out to prove him wrong. He wanted to introduce Europeans to American wildlife and crops – and he got the chance to do that when Congress appointed him “minister plenipotentiary” to France. There, in his garden he planted corn and watermelons, and he passed out persimmon plants and sumac seeds to friends. 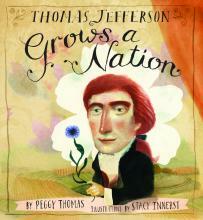 This is a delightful look at Jefferson’s agricultural explorations and his attempts to “grow” a nation from the soil on up. Back matter includes discussion about the Founding Fathers’ struggle over a vision for this new nation: one of agriculture and farmers? or one of merchants and industry? “Everyone loves earmuffs! But have you ever wondered who invented the earmuff? Looking for a way to get middle grade (and older) students excited to read about history? Look no further than Guts & Glory: The Vikings by Ben Thompson. As the author points out in the “Author’s Note” at the beginning of the book, the Vikings are prevalent in our popular culture, ranging from the names of football teams to characters in movies. Much of what is portrayed, however, can be misleading or downright wrong. For example, ask anyone to draw a Viking and he or she will probably draw a figure with a horned helmet, yet hard evidence shows that real Viking helmets never had horns. To correct the errors, the author has done extensive research to bring the most current understanding of Vikings history to the reader. Ben Thompson has a distinctive voice that is incredibly fun to read. He writes about the Vikings in an authoritative, and yet loosely conversational way, using words like “cool” and “sweet.” It is somewhat reminiscent of Elizabeth Levy’s hugely popular America’s Horrible History series, which my family devoured again and again. As Ben Thompson says in this “History is Awesome” article, he writes history like he would have wanted to read it, and he has succeeded in creating something memorable. Guts & Glory: The Vikings is a meaty middle grade title that would definitely appeal to older and reluctant readers, including young adults. History buffs will love it, and those who aren’t history buffs are likely to be inspired to find a new passion. Originally featured at Wrapped In Foil. Imagine a picture book with chapters, combined with an activity book, all with the focus of inspiring young children to play around with tools of computer programming. At the core of this book is a philosophy that play is integral to learning, and that coding is a way to express yourself through play, like crayons or LEGO blocks. This is no coding guide. 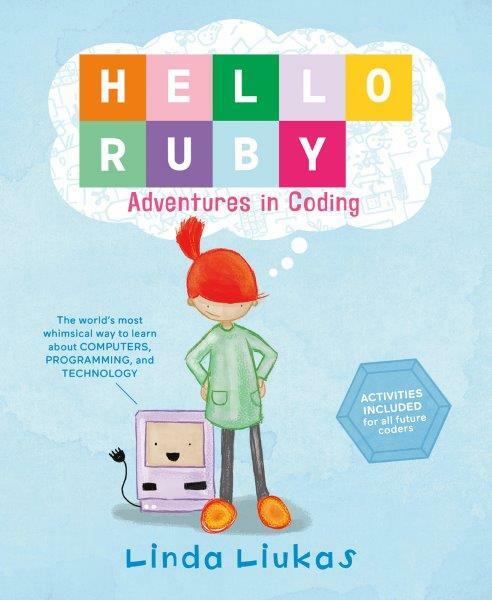 Instead, Hello Ruby introduces fundamentals of the kind of thinking that kid coders need: how to break big problems into small problems; how to look for patterns; and how to write step-by-step directions (useful not only in sharing recipes but also in telling a computer what to do). Ruby, the character in this book, is a small girl with a huge imagination and lots of cool friends. She builds things using her imagination, and that sometimes means making maps, gathering information, and testing out different solutions to problems. The second half of the book is a collection of activities designed for parents and children to explore together. This is where the actual “coding” comes in. For example, how would you instruct Ruby in making her bed? You see, coding is how you tell a computer what things to do, and what order to do them in. This back section is where you play with logic, meet Booleans, and decode a secret language. Perfect for cold winter afternoons! Head on over to Sally’s Bookshelf to catch an interview with author, Linda Liukas. Also, this week is Hour of Code, so check out Archimedes Notebook for some hands-on activities.